The inaugural race is to be held in 2016, and I must admit to being slightly tempted to take part. My ultra running has taught me the importance of getting yourself mentally prepared for the terrain ahead. Tackling the Cape Wrath Trail imposes similar physical rigours and unlike other trails that are less arduous, it's worth giving some thought to how you'll deal mentally with adversity. When I first walked the trail, even as a seasoned hill walker with many years experience in the Scottish Highlands, I remember being quite surprised at how punishing the series of consecutive days over very rough country with a pack proved to be. I particularly like this article, which gives a very honest account of a Cape Wrath Trail expedition that didn't go according to plan. When I first started researching the guide, the only time of year I could get a decent amount of time off was at Christmas, hence a couple of early expeditions in midwinter, including one during one of the coldest winters in 20 years. I still remember being huddled in my Hilleberg Akto on a desolate shoulder of Ben More while a blizzard raged around me. 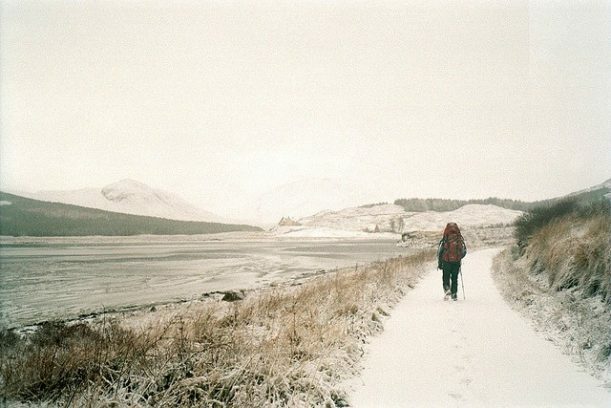 In the morning, the blizzard still hadn't abated and I had to thaw my boots on a tiny gas stove before setting off towards Loch Glencoul through waist deep drifts. I remember being very conscious about how far away from anything I was (at least a day and a half's walk from the nearest road) and how marginal the conditions were. Despite the physical hardship, it was quite an intoxicating and liberating experience. When I eventually reached Glencoul bothy I found that it had been left stocked with coal and plentiful firewood which I used to dry out my kit and down bag that were by now sodden. If I had found it cold and dank, I think I would have been sorely tempted to throw in the towel and quit. It's not just in winter that the trail will test your mental toughness. At any time of year you'll be likely to encounter days of poor weather and the wear and tear on even well hardened feet can be significant. So if you haven't prepared mentally for these circumstances then thoughts can turn to giving up at the next available escape point. From my ultra running, I've found that at least a third of your effort is about mental toughness. If you can convince your mind to keep going then your body generally follows. So as you prepare for the trail, give plenty of thought to how you'll handle adversity when it inevitably comes. Visualise yourself descending to Sandwood Bay and reaching the lighthouse, and the dark moments and thoughts will soon pass. You're on the journey of a lifetime, especially if you run it in one go!